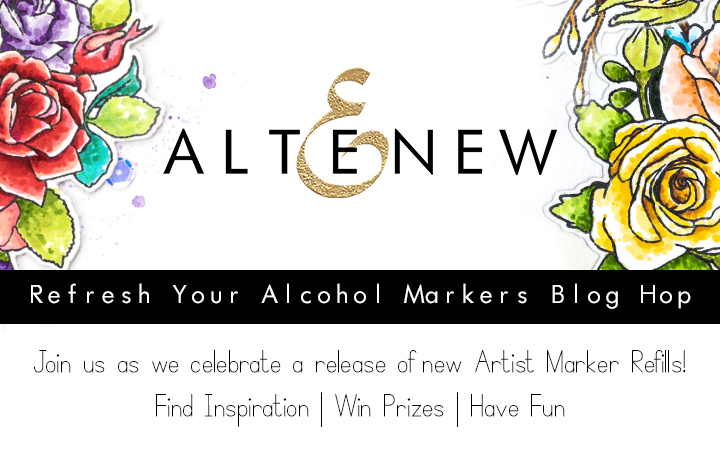 Good morning and welcome to our Refresh Your Alcohol Markers Blog Hop! Today is the day that many of you have been waiting for… we just released refills for our Artist Markers! If your markers are starting to get a bit dry (or if you love doing alcohol ink techniques), these refills are for you! For my card today, I focused on the Beautiful Lady Stamp Set. 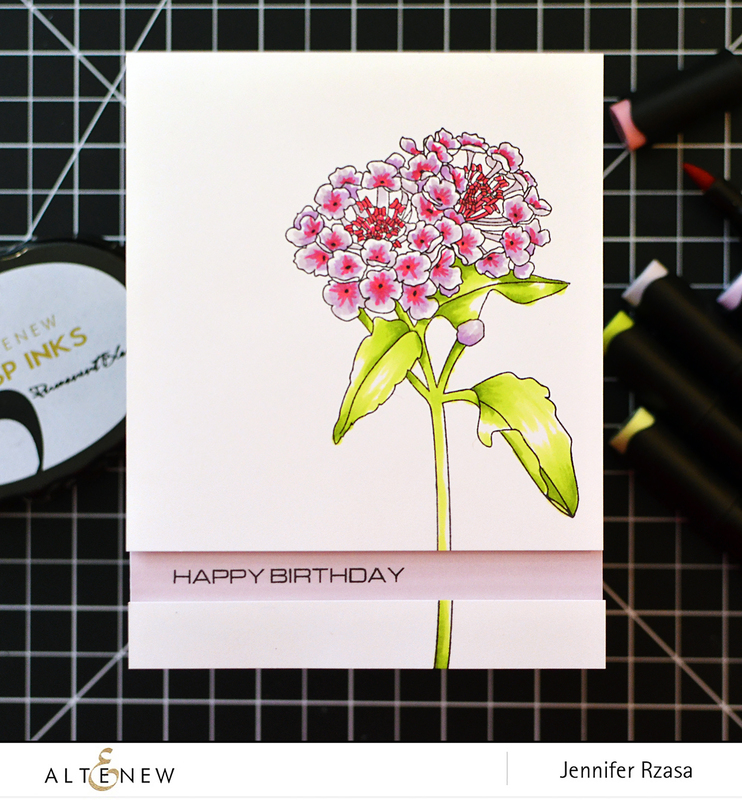 I stamped the lantana flower with Permanent Black Ink, then colored it with shades of purple and pink. I did a bit of research to see what colors they bloom in, and there are some really fun varieties! The markers I used were Coral Berry, Soft Lilac, and Lavender Fields for the flower, and Frayed Leaf and Forest Glades for the leaves. These markers come from the Green Fields Set, the Shades of Purple Set, and the Red Cosmos Set. To help my sentiment stand out, I cut a strip away from my stamped panel. Then, I colored a bit of Soft Lilac onto the card base to coordinate with the flower, and stamped my sentiment in Permanent Black. To finish the card, I adhered the flower panel to the card base with foam tape. 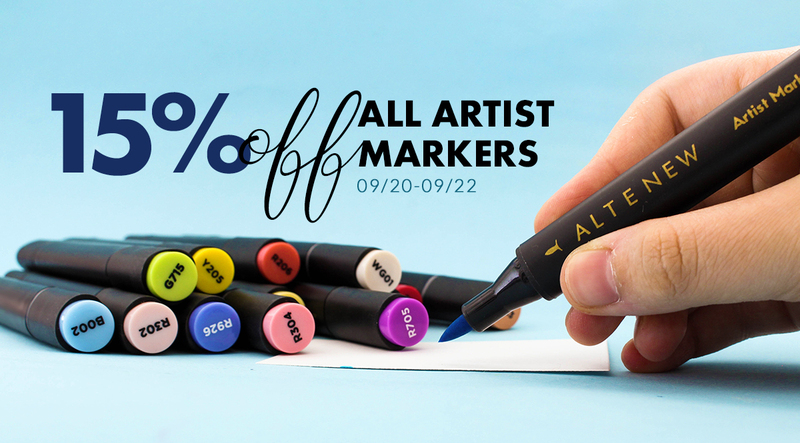 Save 15% Off All Artist Markers from 9/20/2018 at 12:01 AM EDT until 9/22/2018 at 11:59 PM EDT. No code needed to enjoy this sale! Not valid on previous purchases. Shop HERE. Altenew is giving away a $30 gift certificate to SIX lucky winners! Please leave a comment here on the Altenew Card Blog and/or Altenew Scrapbook Blog by Wednesday, September 26th for a chance to win. Six winners will be announced on both blogs, three on the Card Blog and three on the Scrapbook Blog, on 9/29/2018. Beautiful card! I love the fun cut out strip; it adds such a great touch! The card is lovely. I thoroughly enjoyed the blog hop. Love the new marker refills. They are so versatile! Jennifer I love your coloring! This flower is soooooo fresh that I could reach out and pick it! Very, very pretty :) Thanks for sharing!